By the time November arrives, our forest is basically leafless. There are always oak trees that hold onto a portion of their leaves all winter long, but for the most part, the rest of the canopy now rests as a glorious carpet gracing our forest floor. 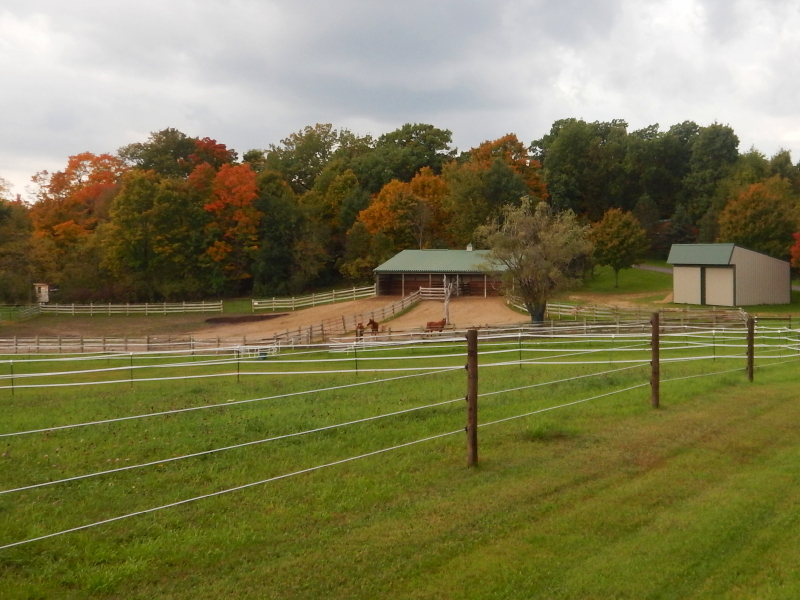 Seems just a blink ago that I was showing off the fall color starting in the trees behind the barn. I tried matching the picture yesterday without having first looked back at the original image to see that I had stood back far enough to include the hay-field fence in the first view. Some deft cropping provides a pretty close comparison, regardless. 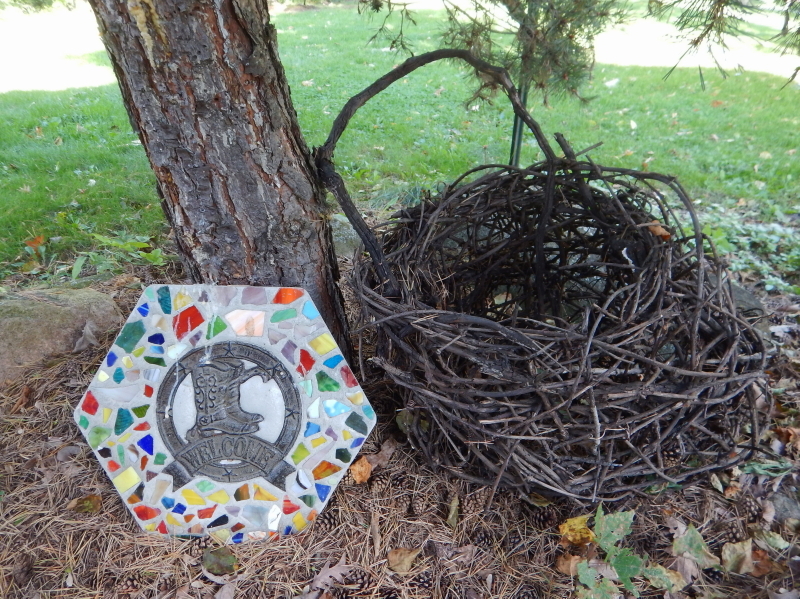 We lucked out yesterday with sunshine all day long, which allowed Delilah and I to pick off a variety of small projects. With her tethered to the loop in my Carhartt pants, or sometimes to a nearby tree, she shows every sign of believing herself an integral partner in accomplishing my goals. Ah, but the added hassles it creates for me is a small price to pay for the look in her eyes and spring in her step as she checks with me to determine which direction we go next. Back and forth, I go, crunching through the deep carpet of fallen leaves. It was one week ago that I wrote about the waning days of summer and my noticing colored leaves in our grass beneath the tree that always turns early. Now, on the last day of August, it’s probably right on schedule that I noticed my first scent of dry leaves in our woods. It doesn’t even look like there are enough leaves on the ground to be noticeable, but the smell is there. 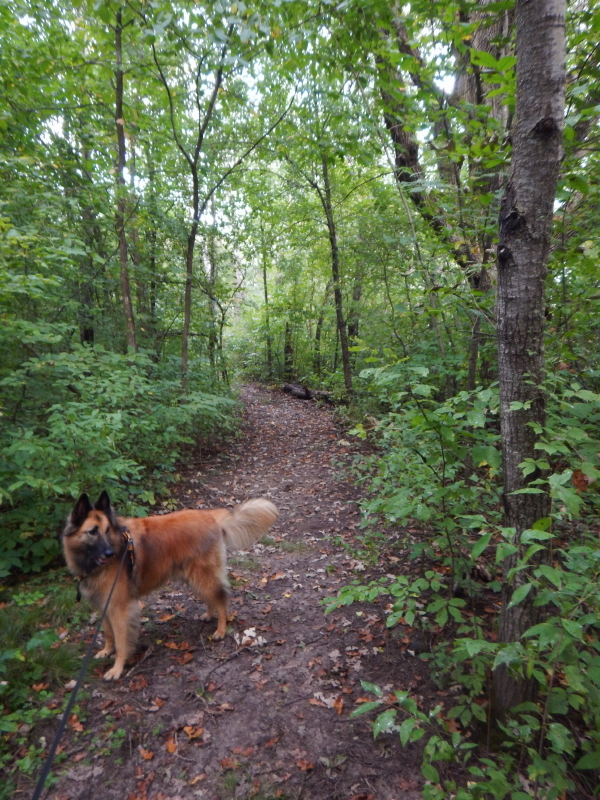 I was doing some forest bathing with Delilah and breathing in the aroma as we walked the trail. It made me think of September, and then I realized that the month begins tomorrow. The smell may not be early, but it seems like it is. Last night was a gorgeous summer evening with a perfect temperature and fabulous sky when Delilah and I headed out later in the evening to tuck the chickens in their coop for the night. The horses had wandered through the open gate out onto the grass of the middle pasture again, and the scene was a perfect picture-postcard moment. 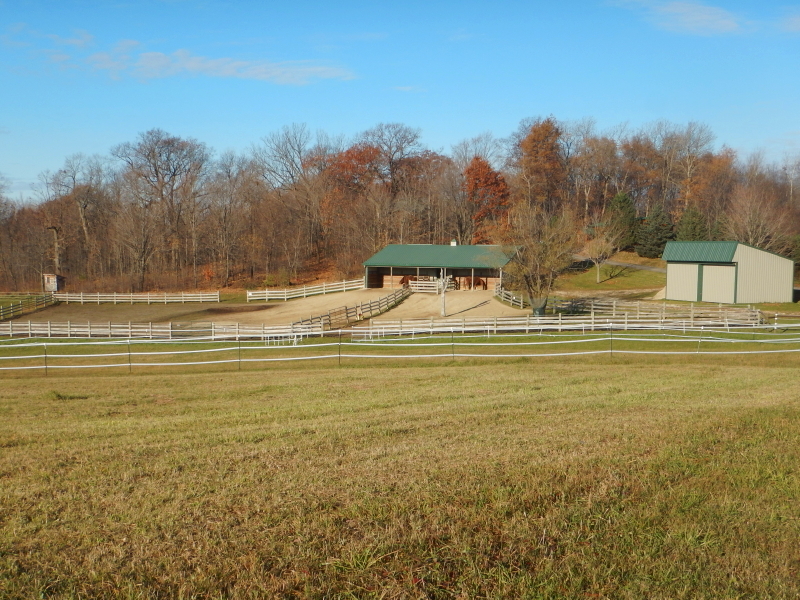 In sharp contrast to the travails of so many other people and places in the world, the sanctuary of our property is quite the healing balm for whatever assails my being. The aroma of fallen leaves comes as a particularly precious added bonus. I stepped outside to search for some fall scenery to photograph after I got home from work yesterday and was rewarded well beyond my expectations. It helps to never grow too accustomed to the beautiful surroundings we enjoy here. It would be a shame to ever take this gorgeous place for granted. The key factor yesterday was that it wasn’t raining. There was actually some blue sky visible. With a high pressure system moving in, we are hoping to for several dry days in a row. It is likely to deliver a dose of our best of autumn weather. 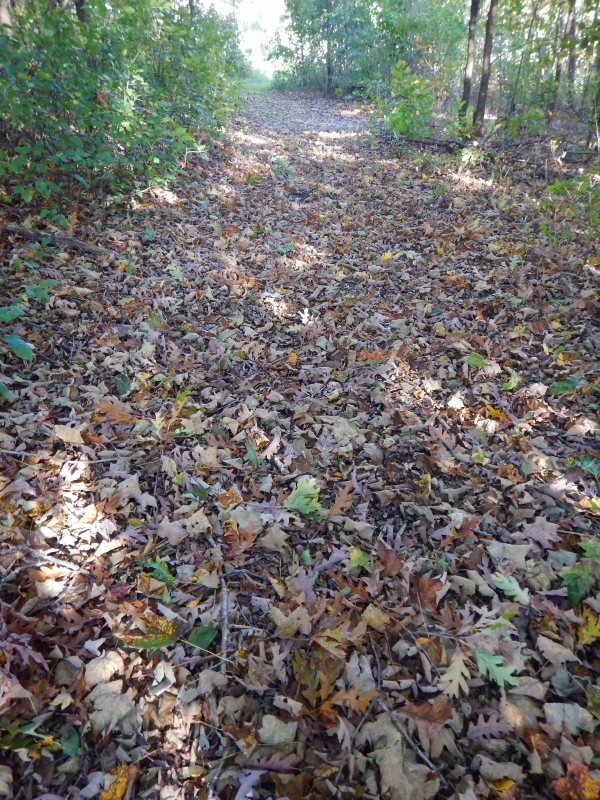 Many of our trails are developing a carpet of fallen leaves that provide a crunch when you walk. More importantly, they are filling the air with the unmistakable scent of the season. When I walk toward the pastures and pop out of the trees, the horses show signs of wondering what huge creature is making all that racket. Just this huge creature, is all. When I got down to our Rowcliffe Forest Garden Labyrinth, the sunlight was getting low. Cyndie had recently mowed and weeded the labyrinth, which gave it a well-tended glow anyway. I walked to the far side and paused to stare at the beauty all around me. I was looking away from the entrance for the shortest of moments, and when I turned back around I was startled by the sudden silent presence of a lone young deer happily standing nearby.